Dimensions: 7" square x 3 1/2"
This unique wishing well features an intricately-designed organic Cubist design and is made of Basswood. 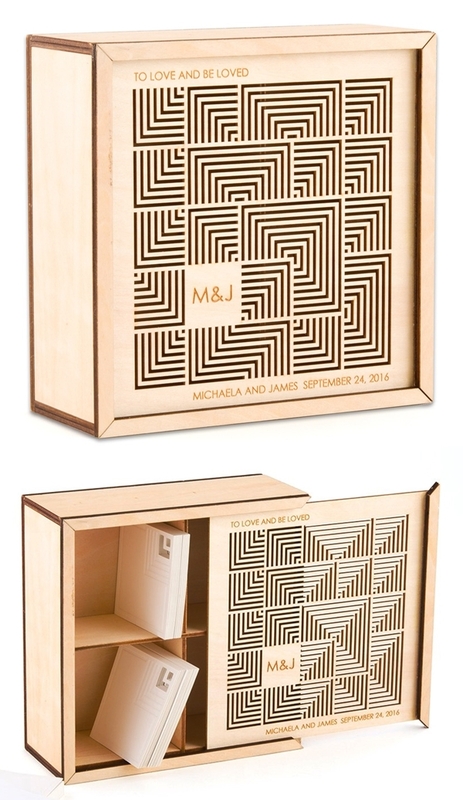 It may be personalize with the bride and groom's first name initials and two lines of custom text etched into the wood (in the places and the font shown only), such as your names, wedding date and a special message (ex. "To love and be loved"). PLEASE NOTE: The pictured Cubist laser-embossed stationery/well wishes cards are not included but are available separately as Product Code: ER9548.